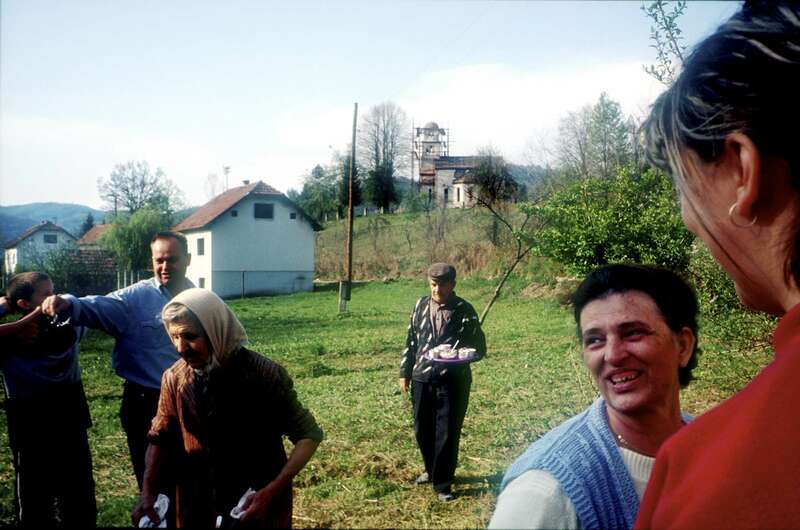 Serb families gather for coffee in the village of Bocinja. Although Serbs lived in the village throughout the war, they fled once the cease fire was signed in the fall of 1994. Several Islamic mujahideen, who had come from Arab countries to fight during the war, moved in to the village and refused to leave when Serb owners wanted to return. International and Bosnian officials finally intervened and removed the mujahideen. As they left, the mujahideen damaged several houses, as well as the Orthodox church in the background, which was being repaired at the time the photo was taken.